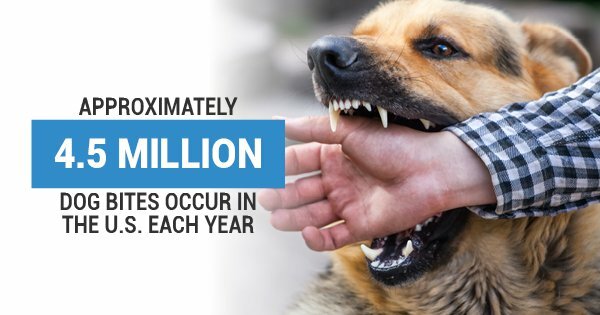 According to the Centers For Disease Control and Prevention, approximately 4.5 million dog bites occur in the U.S. each year. With an estimated 70 million dogs living in U.S. households, this statistic may not come as much of a shock to you. Still, regardless of whether or not you have a dog of your own, understanding basic safety precautions is essential. By knowing how to avoid a potential animal attack, you can protect yourself and, in turn, pass on that knowledge to your kids and other family members, as well. As any dog bite victim can tell you, it only takes a moment for a serious accident to occur. One simple mistake or misstep and you can find yourself seriously injured. In Texas, you have the option of hiring a personal injury lawyer and suing the person or people responsible for the dog. Winning your case means collecting payment to cover your medical bills and other expenses caused by the attack. But wouldn’t you rather avoid the attack altogether? If you're passing by an owner walking their dog and want to pet the animal, approach it very carefully (and, of course, don’t pet it unless you ask the owner first). Some dogs are extremely territorial or anxious about their surroundings, making them more prone to attack when a stranger approaches too quickly. Never be pushy — if the owner seems to be nervous, you should be too. This also applies to dog owners themselves — if you're walking your dog, be cautious when you approach another person walking their dog. It's often best to cross the street and avoid letting the dogs make contact. After children, senior citizens are the second most common dog bite victims. That's why it's especially important for families with young children to consider the temperament of a dog before introducing it into the household. Similarly, you should be very diligent about keeping your children educated about how to properly and safely interact with a dog — never get too close to their face, hang off of them, or agitate their personal space. Like humans, dogs have personal boundaries that can make them feel uncomfortable and even provoke an attack if they feel that their space has been violated. If you feel threatened by a dog in any way, experts say you should remain motionless, and if the dog knocks you over, it's best to curl into a ball with your head tucked in and your hands covering your ears and neck. If the dog hasn't yet made physical contact, don't make any loud or sudden noises — instead, say “no” or”'go home” in a deep and firm voice. If you do sustain any injuries, look at them closely. Minor injuries can be cleaned with soap and water. But if it's a more severe injury, (e.g., there's severe swelling, exposed bone or muscle, uncontrollable bleeding, loss of function, or severe pain), see a health care provider immediately or call 911. In many cases, a personal injury attorney specializing in dog bite cases can help you get the compensation you may be entitled to as a result of the injuries you've sustained. Never hesitate to reach out to an experienced dog bite attorney like myself to help you navigate the legal process. In 2017, insurers across the country paid nearly $700 million in claims related to dog bites, according to estimates from the Insurance Information Institute. That means that if you, your child, or another loved one was wrongfully hurt by a dog, you may be able to collect payment, too. While I sincerely hope you’re reading this article for preventative purposes only, know that I am available to answer questions about dog bite accident claims and personal injury cases in general. To learn more, I encourage you to call my office at 832-956-1138 or visit my personal injury website.